The old pines trail takes you to the heart of Glen Tanar's magnificent forest and you are never far from the sparkling Water of Tanar. The path consists of a mixture of grass surfaces and crushed stone. 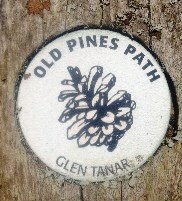 The route is waymarked - follow the Pine Cone symbol on the waymarkers. Please take note of any warning and information signs that the Ranger Service and the Estate have displayed. The recommended starting point is from the Glen Tanar Visitor Centre. There is a 'pay and display' car park clearly signposted. These caches have been placed by agreement with Glen Tanar. In each cache in the 'Old Pines Trail' series you will find a bonus letter and number. Make a note of these bonus letters and numbers and they will allow you to locate the bonus cache at the end of your walk or cycle. The Chapel of Saint Lesmo was built in 1872 on the ruins of the old house of Braeloine. Originally there was a thriving community here during the days of the Drovers, but by the late 19th century the village was deserted. You can find more information on the board at the side of the road near the Chapel. You are welcome to walk in the grounds of the Chapel. On the track by the Chapel you will see a stone platform, stone seating and a drinking trough. There is an engraved stone with the words “Drink Weary Pilgrim, Drink And Pray”. Fdhveeryf znl fgber gurer ahgf urer - ohg abg va guvf bar nf V unir tbg zl pnpur urer !